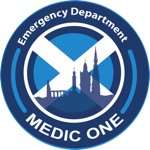 Some of our awesome staff have organised events in the near future to support our charity Medic One. Below are some of the details and how you can support them. Greetings from Ash's alter ego Dr Jager.I am writing to you today because I know that Ash needs your help. As you probably know, Ash has always managed to get himself in some real "jams”. Well, this is no exception. Do you know what he has done this time?He has promised to raise at least 1000 pounds for the Medic One Trust.Surely you realize that he can hardly raise 2 kg dumbbells,much less even 100 pounds .That is why I stayed up last night in order to type this letter.I would appreciate it if you could help him out in any way possible with his fundraising.I promise you there will be more 'running'training than 'jager'training. Fellow partygoers -you can repay him for those hangovers by making him break a leg or two for those pounds you donate !! We would love I if you could sponsor us! Newer PostAM/EM CPD day this Wednesday. See you there! Older PostConsultant post now recruiting, SJH, Livingston. Join the ED team!